Catch up on some of the funniest moments with SpongeBob and friends before the make their comeback on the big screen this February! Just in time for The SpongeBob Movie: Sponge Out Of Water in theaters nationwide this February 2015, fans can relive some of Bikini Bottom’s funniest moments in SpongeBob SquarePants Triple Feature: 10 Happiest Moments, Heroes of Bikini Bottom & Legends of Bikini Bottom. This new DVD set is filled with over four hours of SpongeBob and his friends up to their usual antics in 24 classic episodes. 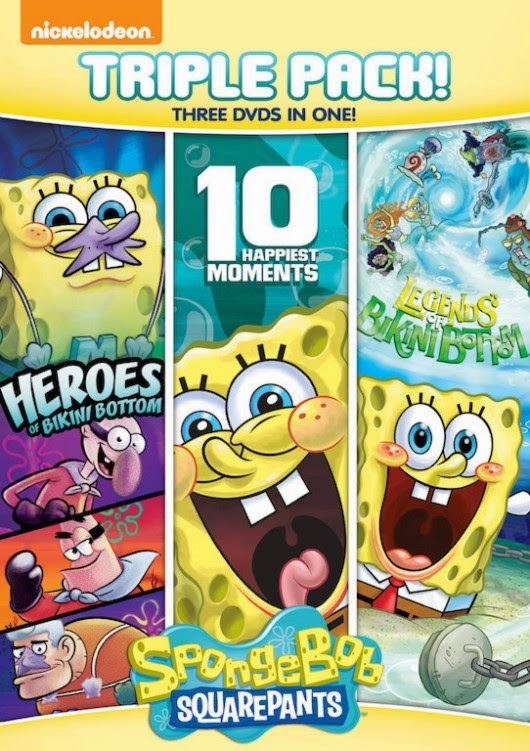 Packed with non-stop fun, SpongeBob SquarePants Triple Feature: 10 Happiest Moments, Heroes of Bikini Bottom & Legends of Bikini Bottom is available on DVD January 13, 2015.